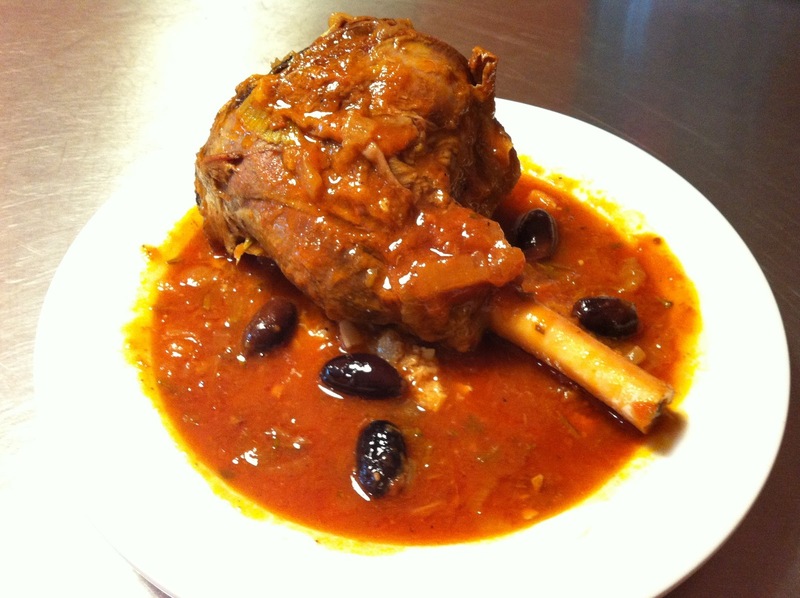 Everyone seems to have lamb on the brain this time of year and these braised lamb shanks will definitely please. While preheating your oven to 375 salt and pepper four to six shanks and brown in a Dutch oven or roasting pan on the stove for about fifteen minutes, turning occasionally. Set the shanks aside and add a chopped onion, carrot, a couple celery stalks, a whole orange sliced in half then into eights, and 12-15 peeled garlic cloves. Sauté for 10 minutes. Add a couple sprigs of chopped fresh rosemary and a cup each of black Greek olives, tomato sauce, chicken stock, and white wine if you have a bottle open otherwise just double up on the stock, then bring to a boil. Put the shanks back in then cover tightly and cook in the oven for an hour and a half or until the lamb is tender. Amazing family dinner and also a great dish if you’re entertaining as you can keep it on hold in the oven on low heat until you’re ready to serve.